Margaret Mitchell's epic novel of love and war won the Pulitzer Prize and went on to give rise to two authorized sequels and one of the most popular and celebrated movies of all time. Many novels have been written about the Civil War and its aftermath. None take us into the burning fields and cities of the American South as Gone With the Wind does, creating haunting scenes and thrilling portraits of characters so vivid that we remember their words and feel their fear and hunger for the rest of our lives. 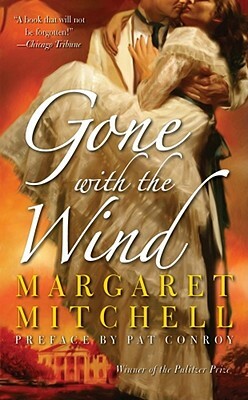 In the two main characters, the white-shouldered, irresistible Scarlett and the flashy, contemptuous Rhett, Margaret Mitchell not only conveyed a timeless story of survival under the harshest of circumstances, she also created two of the most famous lovers in the English-speaking world since Romeo and Juliet. "For sheer readability I can think of nothing it must give way before. Miss Mitchell proves herself a staggeringly gifted storyteller."